Warrington Wolves stayed on course for a league and cup double as they comfortably defeated Hull FC to reach the Super League semi-finals. Wire, who won the Challenge Cup when they beat Leeds Rhinos in August, held a 12-0 half-time lead after tries from Trent Waterhouse and Richie Myler. The hosts moved 24-0 ahead through Stefan Ratchford and Brett Hodgson, who also converted all four tries. Hull pair Tom Briscoe and Ben Crooks crossed for late consolation tries. Warrington, aiming to become the first team to win the Challenge Cup and Super League Grand Final in the same season since St Helens in 2006, have never made a Grand Final appearance. But they took an early lead when a 14th-minute cross-kick from Lee Briers was fumbled and Waterhouse got there first to touch down, although the video referee was needed to verify the score. Briers was again involved in Warrington's second try, finding Myler, who sprinted through a gap in the Hull defence to register his fourth try in Wire's last five home matches. The Wolves had only won two of their previous 10 play-off matches since 2003 but Ratchford stretched their advantage further when he collected his own kick-through, which had bounced off the foot of the post, to make it 18-0. Hull thought they had started the fightback when Jamie Foster touched down but he was denied due to a forward pass from Jordan Turner. Myler then created Warrington's fourth when he sliced through Hull's tiring side before offloading to full-back Hodgson for an easy score. The visitors finally got some points on the board with 14 minutes left, Briscoe getting on the end of a kick over the top. Replacement Crooks completed a fine team move to reduce the score to 24-12 but it was too little, too late. Warrington join Leeds, St Helens and Wigan in the final four and will learn their semi-final opponents at Sunday's Clubcall announcement. 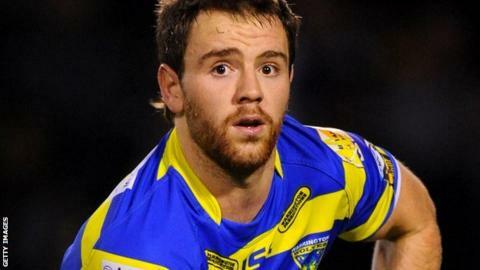 "Stefan Ratchford showed what he can do. He has the ball on a string at times. It's nice to have that bit of X factor in your team. "He has been doing that type of thing in games all year. He's been a great addition to us." "I thought our pack was very good defensively and the work that Trent Waterhouse did tonight was unbelievable. "I thought it was a good, hard, tough game of rugby league, finals footie by both teams. "Hull defended very well to keep us to 12 at half-time and we did pretty well to defend right throughout the game." "We came here with a genuine belief that we could cause an upset and I think we probably didn't do it justice by our completion rate. "Defensively I thought we were fantastic but our execution at times left a lot to be desired. "I think we lost the ruck and that's where we lost the game. We defended tremendously. "To only concede four tries, two of those from kicks against one of the top sides of the competition, with the amount of field position and also possession we gave them, it's a fantastic effort. "You get a real good look at the character of the side and what they do in defence and I think in the last month we've pretty much nailed that." Warrington: Hodgson; Riley, Ratchford, Atkins, J Monaghan; Briers, Myler; Morley, Higham, Hill, Waterhouse, Harrison, Grix. Replacements: M Monaghan, McCarthy, Wood, Cooper. Hull: Horne; Foster, Turner, Yeaman, T Briscoe; Seymour, Heremaia; Watts, Houghton, Lynch, Manu, Westerman, Aspinwall. Replacements: O'Meley, Crooks, Green, Pitts.